A young Palm Beach County boy with dyslexia is not only helping others with the same reading disorder also but helping dogs find loveable homes. 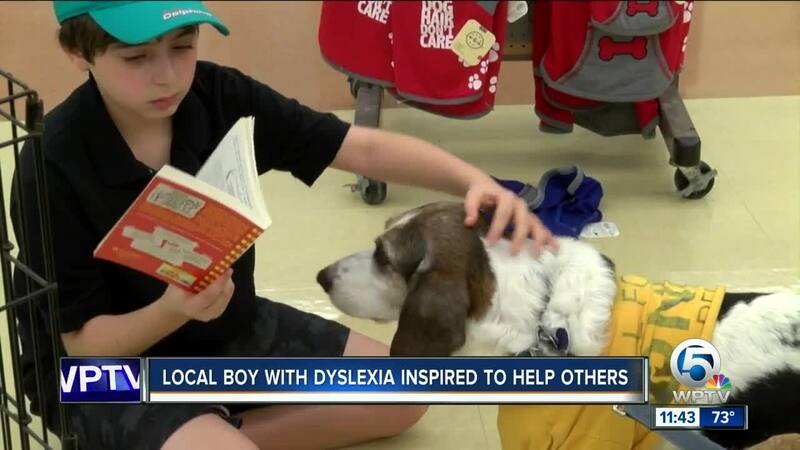 PALM BEACH GARDENS, Fla. — A young Palm Beach County boy with dyslexia is not only helping others with the same reading disorder also but helping dogs find loveable homes. Shane Herman, 11, is the founder of the nonprofit "Let's Get Booking" and through his own struggles of reading out loud, he's now focusing on helping others face their fears. "Even when I make a million mistakes dogs don't judge you," said Herman. "When I'm judged it makes me feel stupid, and it makes me feel like I'm reading all my words wrong, but when I read to dogs they are really, they really appreciate being read to," said Shane. "I was laughed at by many people and it felt terrible," said Herman. Earlier this year, “Let's Get Booking” as a way to help others in the community overcome similar situations and gain confidence, but his work is now also giving rescue dogs a new life. "It's a win, win situation. The kids are learning how to read, and the dogs are getting the attention they need before they find a forever home," said Gerard Boglioli, a store leader at Petco.